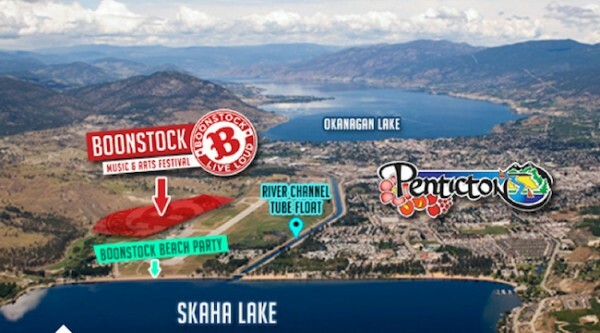 The Boonstock Music Festival is moving from Gibbons, AB to Penticton, BC in 2014. Kelowna’s http://centerofgravity.ca/ will be moving dates to earlier in teh summer, so this becomes the big festival for the Okanagan on the long weekend in August. Over the last two years, Bookstock has attracted a lot of Acts such as Limp Bizkit, Godsmack, Korn, Billy Talent, Puddle of Mudd, Volbeat, Buckcherry, Sublime with Rome, Drop Kick Murphy’s, Sebastian Bach, and Everlast. Don’t forget, The Pemberton Music Festival returns in 2014 from July 18-20. Start saving your music festival money! Organizers of the Boonstock Music Festival recently announced they had found a new location and a new date for their 10th anniversary. Penticton was deemed an appropriate choice because of its hot weather, breathtaking scenery and a site that has water nearby. Penticton CEO Annette Antoniak said she only learned of the decision to bring the festival here on Monday. Antoniak said they were further informed the promoter would be meeting with the RCMP superintendent today. The festival is set to take place Aug. 1-3, 2014. The move comes after officials in Sturgeon County, Alberta voted to put an end to the festival in September. Their decision was based on a number of complaints from area residents, along with police and health officials, over the long-running and popular festival. Colin Kobza, president of the Boonstock Entertainment and Arts Society, admits there were problems with the location. It was a small parcel of land with problems with exiting and entering, as well as security and crime, he said. Further information on ticketing and reasons for the move are on their website, at http://www.boonstock.ca.